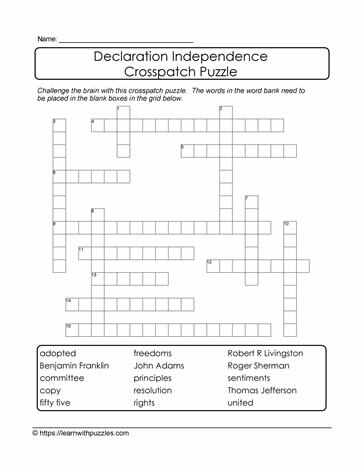 Declaration of Independence crosspatch printable puzzle. Challenging family, friends and classmates to see who can be the first to complete the downloadable puzzle. Suitable for formative assessments in late elementary grade 5,6 classrooms. Some differentiated support may be necessary. This printable crosspatch puzzle is a great addition to complement learning classrooms and home schooling environment.